Note that household net worth as a percent of disposable income reached its lowest point during the crisis in 2009:Q1 with a value of about 450%. At this point, household net worth was put back to where it was in late 1985! 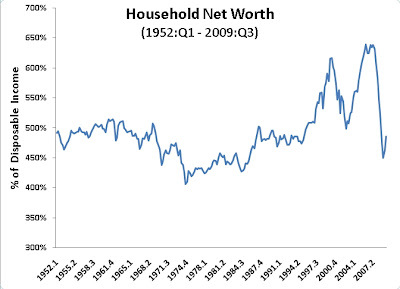 For the latest observation of 2009:Q3 household net worth is about 485%, which is approximately where it was on average for the entire 1987:Q1-1993:Q1 period. The bottom line is that household balance sheets have been put back almost two decades. This is both amazing and alarming. Now repairing household balance sheets will not be an easy task. Here are the options: First, reduce household liabilities by (1) writing down claims against households and/or (2) wide-scale household bankruptcy. Second, increase household assets through (3) a new asset boom cycle and/or (4) increased household saving. Options (1) and (2) are undesirable since they would add further disruptions to an already weakened financial system. Option (3) seems unlikely unless there is some truly new innovation (e.g. green energy) that takes off. That leaves option (4) which is already happening as the U.S. personal saving (and overall private saving) rate has increased since the downturn. This approach to improving household balance sheets , however, creates its own set of problems. First, it is not a quick fix. It may take years this way to fully repair household balance sheets that have been put back two decades. Second, as noted by Martin Wolf, the higher household saving means a drop in total spending and ultimately broader economic activity. As a result, government spending has stepped in to fill the aggregate demand gap by running budget deficits. However, given that the decline in spending by households may last years the aggregate demand gap spending by government may also last years. This , in turn, raises the specter of sovereign bankruptcy. In short, in the absence of another asset boom the U.S. economy faces the possibility of wide-scale private sector bankruptcy or public sector bankruptcy. Martin Wolf agrees as does Paul Krugman. You can run but you cannot hide from the problems with household balance sheets. Update:To be clear, U.S. sovereign bankruptcy may mean inflating away some of its debt. There need not be an explicit default. This , in turn, raises the specter of sovereign bankruptcy. Barney Frank: "Do you think there is any realistic prospect of America’s defaulting on its debt in the near future?" Bernanke: "Not unless Congress decides not to pay…." As issuer of a non-convertible flexible rate currency, the US government is not financially constrained. The debt limit it a voluntary constraint imposed politically. Does anyone really think that the US Congress will decide to default on the national debt? Here in the UK real life analysis makes it clear to me that the unemployment figures are being massaged ie the position is worse than official figures suggest and set to deteriorate further - I suspect the same is about to happen in the USA. Against that background there is no prospect of household spending picking up for many years so the parcel passes back to the Governments. The bond markets already suspect that ultimately this is very likely to precipitate a sovereign default and then the dominoes will start to fall. I have no desire to be negative but sadly as far as the anglo american economies are concerned,taken as a unit, I think the words of ex president Bush sum up the outlook ie ..." this sucker is going down "
The first peak is the result of the stock market exuberance of the late 90´s. The second comes from the house price boom. Since those developments were not sustainable (bubble), the household NW is back to where it should be. When I look at that chart I see a decades long steady-state level of net worth as a percentage of income with two anomalous spikes caused by two temporary run-ups in asset prices (aka bubbles: dot-com followed by housing). It looks to me like we are now back to normal and I don't expect households to scrimp and save to try to get the ratio back up to where it was at the peaks of the past two bubbles. After all, households never made any particular effort to push the ratio much over 450% in the past. Increased household saving doesn't require reduced aggregate expenditures. It requires a shift in expenditures from consumption to investment. Household net worth isn't an end in itself. It's purpose is to increase the ability to consume in the future. I am surprised you repeat this naive Keynesian claims without comment. The decision to default versus inflate is not as clear cut as many would make it. At least not in the hypothetical realm where default risk exists. Imagine that hyperinflationary fears rise, pushing up term rates to punishing levels and causing massive capital flight from the dollar. As a result, investment grinds to a halt, unemployment remains at double digits, and store shelves are constantly empty. The only way out of that situation is monetary and fiscal austerity, but both will cause the deficit to widen as the economy crashes, and therefore creditors/speculators do not reward that prospect with lower rates and less capital flight. In the above scenario, very little is gained by trying to "inflate away" the debt. It would be better to default -- probably selectively default on certain credits. The reason is that cutting principal eliminates the lower growth/higher deficit dynamic, and it clears the way for austerity to create its healing effects. Inflation proponents assume, "if we default, no one will lend us any money, so we will have to have austerity and a likely depression." What they miss is, "if we inflate, no one will lend us any money OR want to hold our currency, therefore we will end up with chronic stagnation AND a massive depression once we eventually slam on the brakes." Lastly, I have to note that the "let's just inflate away the debt" argument assumes relative stupidity on the part of current and future creditors. Current creditors will want to hedge principal: they won't just sit there and let it erode. That causes massive capital flight as they seek to exchange dollars for other currencies. Likewise, future creditors will demand punishing nominal AND real term premiums in exchange for the risk of principal erosion. Needless to say, there is no free lunch. If I've understood this correctly (which may not be the case), isn't there another way of raising the ratio of household net worth as a percentage of disposable income ? Option 5) drive disposable income down ! The decline in household net worth is due almost entirely to the decline in the value of residential real estate and equities. That’s causing households to save more, which is causing household debt (mortgages and consumer credit) to flat line and aggregate demand to cliff dive. The only way households can save substantially more than before is through the government supplying new net saving to the non government sector via budget deficits. Those deficits are reflected as increases in direct and indirect financial assets (i.e. government bonds or indirect claims on them) held by households, so long as the current account deficit isn’t deteriorating. The US is a zillion miles from structural inflation. Big deficits are necessary now.